Last week trading in my account wasn’t as bad as it originally looked like. Today, I reviewed my account, calculated all numbers and waited for my “Personal Capital” numbers to come in. I let Personal Capital to watch all my accounts. It tracks all my trades and balances. Although my investing or trading style doesn’t fit into a predefined investing style Personal Capital uses for a typical investor, it tracks my balances well and compares them to the market. When I try to perform an investing checkup, it returns a message that my portfolio is leveraged from using margin and their analysis does not apply to leveraged portfolios. 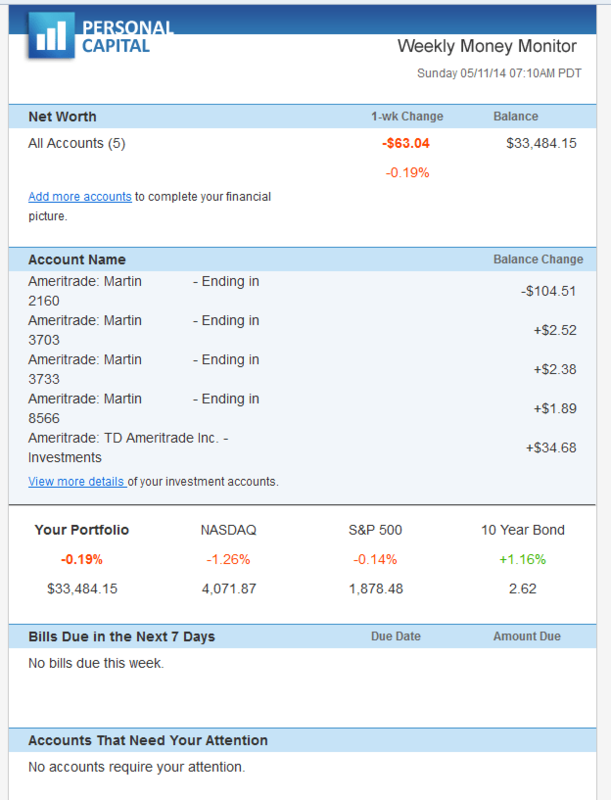 Nevertheless, it still at least provides a comparison of how my accounts perform compared to markets. I like to have an outsourced source analysis my portfolio performance for a view out of my own bias. Personal capital does this for me at some point. I use this information in my “Weekly Monitor” chart at the top of the blog to show, how my accounts performed for the last week. And, it is unbiased information from a third party and not my own calculations, which could be tweaked to make my accounts look better than they are. But that is not my intent. I want to show my road to retirement and wealth in a true and correct way. Show to all my readers that it is possible to start with small money and build your account into a large source of your retirement. And that you can build it quickly if you want. All you need to do is to have a plan and execute it. From the charts in section “My Holdings” you can see, that I started rebuilding my portfolio in 2012 after I almost depleted it with a reckless trading. Since then I successfully raised cash by contributing and options trading and invested in into dividend paying stocks, which further contribute to my portfolio growth. And every investor can do the same and use the exact same investing vehicles to multiple your account balance and income. By a diligent saving and investing I multiplied my dividend income (check the Dividend & Options Income” table at My Trades page). Last week was a bit difficult to me as I am not only a dividend growth investor, but also an option trader as I believe that options can help adding more cash to my account which can be used for more dividend stock purchases later. Yet, the week was difficult, it didn’t end as bad as it looked at the first glance. A put selling strategy may be scary for many investors and a lot of brokers will probably tell you the same, but if you learn and have a plan for every single trade, you will prevail. As of this writing the premarket data indicate a slightly positive opening tomorrow morning. Will the markets continue on a positive note next week? If so, we will see another round of profits. I wish you good luck next week and happy trading! Thanks for sharing your recent trade data, As you mention it wasn’t so bad. I am curious to know more about your options strategy and put writing. Is this a more common way to trade if you don’t mind being assigned and having to buy the shares. What about covered call writing? Do you do that too?